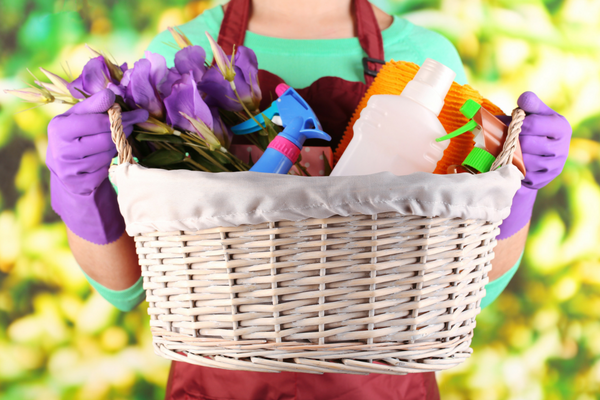 Spring is the perfect time to take care of those cleaning tasks you’ve been putting off. We all know how hectic things can get over the holidays, and during the cold months, it’s challenging enough just to keep up with the day to day chores; however, when the beautiful weather of spring arrives, you can throw open windows, let in some fresh air, and tackle those cleaning jobs. A great place to start with your spring cleaning is the windows. Vacuum or wash curtains, clean the windows, and wipe down the window sills. This can be an excellent way to get rid of dust that can cause indoor allergies, but it will also let you look out at the wonderful new life that spring brings. Trees and flowers are in bloom, and everything seems to be a bit brighter. For many people, the sun and bright colors actually helps them feel more energized and uplifted. In addition to cleaning windows, go through your home and dust off HVAC vents, ceiling fans, door frames, and bric-a-brac. Add some colorful accent pieces and enjoy the beauty of bringing flowers indoors. Many people love to add a touch of nature to their living room or dining room; whether it’s a beautiful plant or a vase of flowers, a bit of nature is a wonderful way to brighten up just about any room. Bedrooms are often some of the most overlooked areas in a home. Of course, this is probably because guests don’t typically see these areas. They can become cluttered with odds and ends that get tossed in a closet because you don’t know what else to do with the stuff. Take some time to sort through closets and drawers, make a pile for items to get rid of. It’s easy to accumulate far more than one needs, so put in an effort to part with any stuff that is unnecessary. You’ll be rewarded with less clutter as well as closets that seem more spacious. You can have a garage sale or donate the items, just don’t bring them back into your home. A good spring cleaning should also include the kitchen. Give appliances a thorough cleaning, and don’t forget to clean behind the stove and refrigerator. Organize cabinets and go through the pantry, throwing out food that is expired or simply isn’t going to be eaten. We all have those items we thought our family would enjoy, but it just didn’t go over as we had expected. There’s no reason to keep things that are outdated or that your family keeps pushing to the back of the pantry; it just adds to the clutter. After everything is organized, it’s time to go to work on the floors. Call in a reputable carpet cleaning company to tackle soiled carpets as well as upholstered furniture. Wash tile or linoleum floors, and don’t forget to dust under the beds. If you have kids, enlist their support and help, they’ll love getting involved, and when the house is all clean and tidy, you can all sit down and enjoy the feeling of a job well done. A clean home is always a happy one.